After posting about Cabelas, it only made sense to write a little about Bass Pro Shops in Rossford, Ohio. 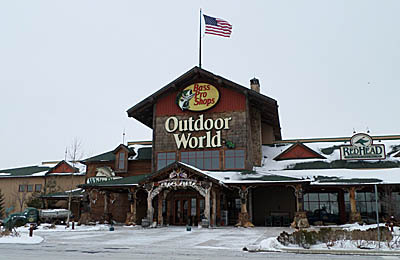 This store opened in 2008, after I had moved away from Toledo, so I haven’t been to it as much as I have Cabelas, despite it being closer. I had always had the impression that it was the ‘stepchild’ to Cabelas, the lessor of the giants if you will. A recent trip changed this opinion and now I view it as equal, if not superior, in some aspects. The lobby of Bass Pro is nothing short of amazing. It has a few lounge chairs and couches that are surrounded by numerous displays with vintage fishing tackle, as well as, photos and mounts. You feel like you have stepped back in time and somehow stumbled upon something no one has seen in years. This is quite a feat considering you are in the entrance of a giant retailor. While I was looking at the antique photos connecting to my ‘brotherhood of anglers’ of years past, the only thing that snapped me out of it was the friendly employee greeting me and asking if I needed help finding anything. I hope this wasn’t a disguised effort to keep me from loitering in the lobby any longer, and if it was, they did a great job convincing me they just wanted to help. 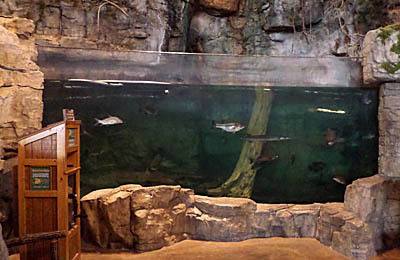 While not nearly as large or a singular attraction to make the trip like at Cabelas, the aquarium at Bass Pro did have some features that were notable. I like how it is set into a scene, looking like it was a pool that naturally formed at the base of a rocky ledge. What I liked the best though, was the diversity of the fish species that were represented. One might think Bass Pro, would be focused largely on bass. What I didn’t realize, is just how much they embrace all the species. 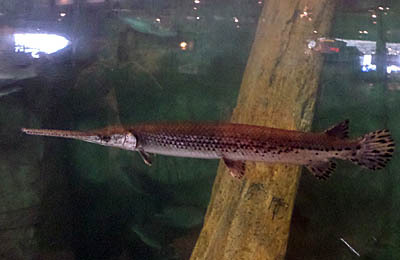 This was evident not only by the aquarium that had Longnose Gar, Freshwater Drum, Channel Catfish, Common Carp and buffalo, but also by, numerous photos around the store that highlighted different species. 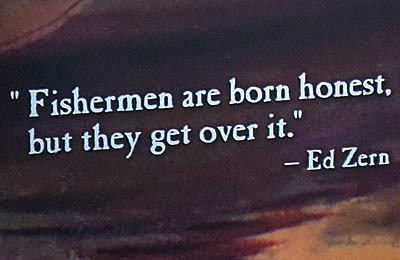 I was told by a staff member that some of the mural photos on the walls were of the owner and his family… and it was notable that these sometimes included ‘rough fish’. I was impressed. The store is well organized and the majority of the staff are eager to help you. I have found a few of the people quick to talk about the local fishing scene or share a story or two. I had a few not so easy to find items on my shopping list this visit, and it was easy to find everything I was looking for. A few items, such as a package of 1/64th oz. hair jigs, were priced well below what I was expecting to pay. I do want to caution about an area that is set designated for signing up for a raffle for a free fishing vacation. It always is portrayed as a special event, but every visit it has been going on. I had made the mistake of filling out the card on my first visit, and my cell phone received numerous calls trying to sell me a fishing vacation packages for well over a year. This continued to happen for quite awhile after my request to be taken off the list and not to be called. Read the fine print, if you fill out a card. Overall, my opinion of Bass Pro was raised after this recent visit where I was looking to scrutinize or compare against Cabelas. 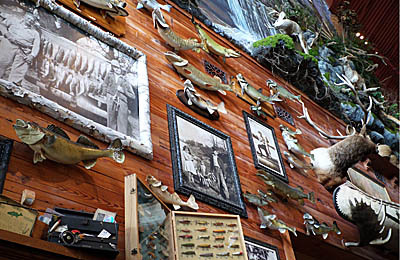 I love the décor and how the designers gave it a quaint fishing cabin feel, yet it is a massive store. I dispelled some myths in my head that Bass Pro was uniquely focused on bass. 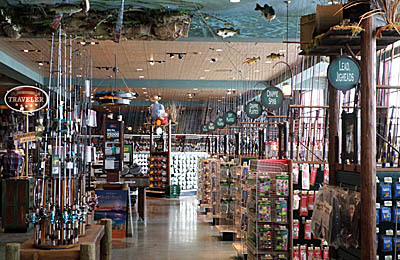 While there was everything you could possibly want for bass fishing, it was evident by the diverse mounts, pictures and murals, and the items the store chooses to stock… that they care about and can equip the most savvy of multi species anglers or people that focus on something other than bass. So when is the trip to Fin Feather planned? I haven’t been there, but have some friends that are big fans. I need to get a visit scheduled!